Arms are said to be appendices to the torso of most human beings, but very fragile and easily seperated from the aforementioned body. This is the reason they have to be protected, most commonly by a piece of equipment referred to as "arms". This double meaning leads to a lot of confusion between the armormaker's guild and the organ harvester's guild, especially when dealing with necromancers. 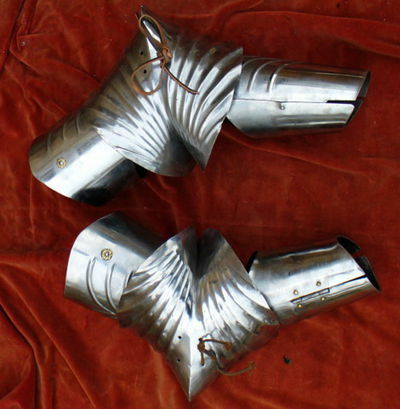 These pieces of armour are usually useless but most heroes persist in wearing them anyway. Arms have one main joint, the elbow. They are attached to the heroes body by the shoulder and usually end in a manipulator commonly referred to as "hand". These different components are composed solely of meat with a few bits of bone in the middle, except in the case of the prosthetic limb where the substances used are pieces of wood supported by an internal structure of long threads known as 'woodworm'. The armour that plates the arm is at most a piece of rusty aluminium foil dotted with holes. The average usefulness of arms armour rates on the Usefulness scale at around 10/10. Such a high rating has only been achieved by use of extreme sarcasm. As for reliability, this is highly variable but is usually just a statistic as the arms of a hero are usually near the edge of their weapon which means there is little they can do to prevent any injury in a fight. Important fact: heroes have not one, but two arms. This page was last edited on 15 October 2012, at 01:46.